According to the July 1967 RDLI regimental magazine called "FLASH", Hugh BENSON had received the MC during WW1. I have found nothing to corroborate this. The MC was instituted in December 1914 as a reward for gallantry for officers of the rank of Captain or below, and for Warrant Officers. Officers over the rank of Captain (Major and above) were eligible for the DSO. 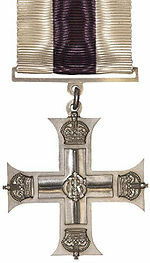 From 1940, the date of the award is engraved on the lower part of the cross. In World War I there were 37,000 MCs awarded, with 3000 first bars, 170 second bars and 4 third bars. During World War II, approximately 10,000 MCs were awarded and 500 first bars. All awards of the MC are listed in the London Gazette. Citations exist for the First World War awards. Since 1993, this medal can be awarded to all qualifying Army ranks.